Sunday and time for some new discoveries. 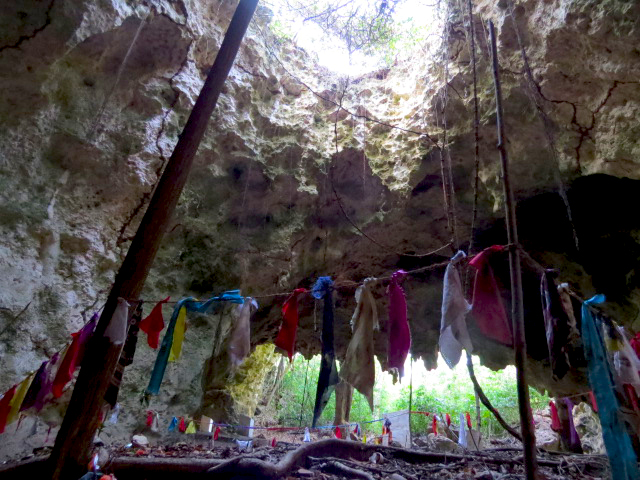 In Jambiani there is a huge voodoo cave in the middle of the bush forest. The trip there is quite pleasant as the path passes through the farming area. Well it is not as you usually picture a farming area as it is coral rocks everywhere but the Jambiani people is doing their very best to grow coconut, papaya and other crops. And going around 4 pm gives us very nice light. 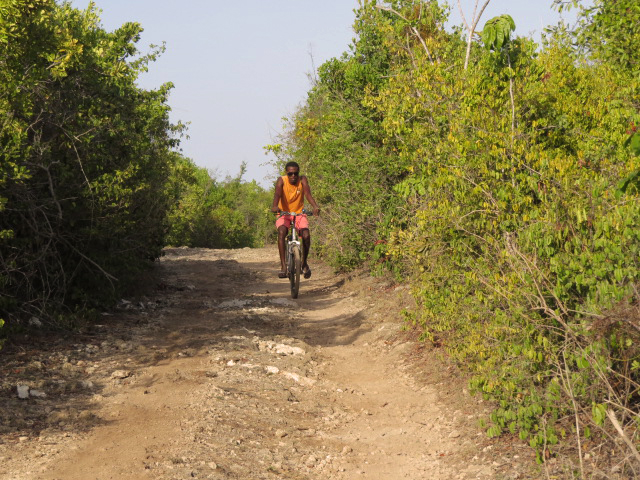 After a bike stroll in Jambiani village passing playful children, cows and small shops we cross the road and enter the forest for a 15 min ride before reaching the water well used to water cows and farms. We try the cold and earthy water and enjoy its freshness. We continue another 15 min in the quiet forest and reach the voodoo cave. 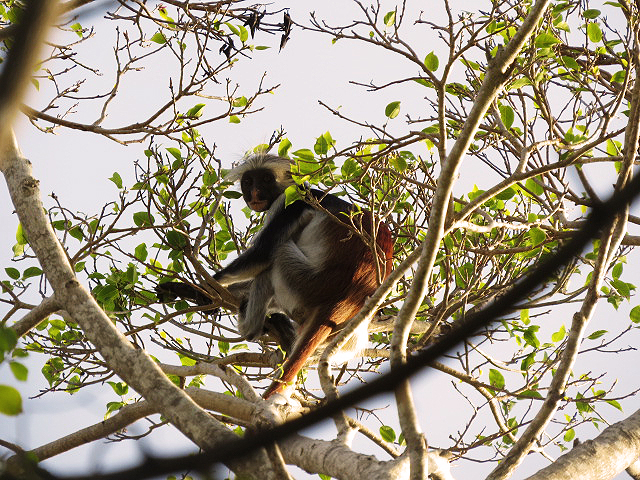 First thing we see is five Red Colobus monkeys jumping around in the tree. Just us and them. Sacred moment . My guide Eddie takes me to enter the cave from the back entrance to get as much mystery as possible. We climb down- and it is huge. About 80 x 60 m. The villagers come here to pray and burn incense as they think the incense calls the spirits to them and that they can influence them with prayers and sacrifices of various fabrics. In the cave human bones from 2000 BC has been found along with some bones from animals from the same period. Also some utensils for making food from the same period has been found. A special happening being here. 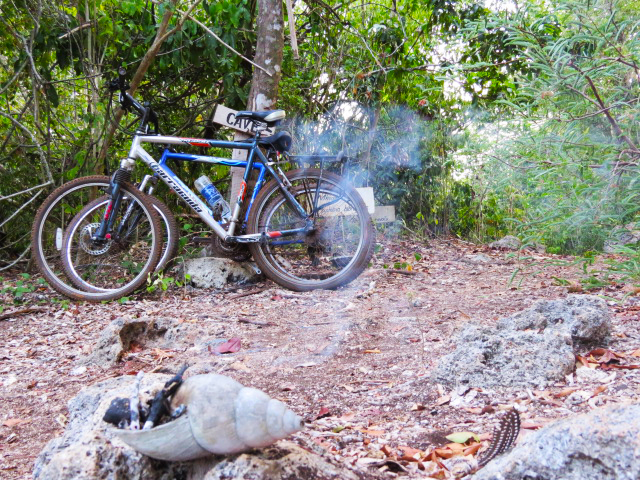 We burn some incense ourselves and have some fruit before going back through another part of the forest where we stop at another cave that used to serve the whole village with water. Stretching back on the tar road is more comfortable than the bumpy coral rock paths but very happy to get some exercise and new experiences.